Double and freeze the marinade and chicken in a gallon size baggie for later. When the chicken defrosts it marinades! Marinade the chicken at least 2 hours. *If you can’t handle soy, try Cybele’s Soy-Free Soy Sauce. 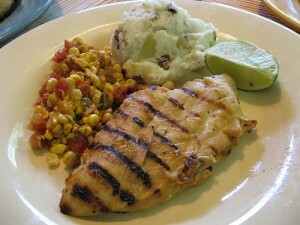 You may also enjoy Asian Chicken Marinade Recipe and Honey Mustard Chicken/Pork Marinade. Ginger and lime are one of my all time favorite flavor combos! This looks and sounds wonderful. Love chicken and I adore ginger. Yummy! I love the idea of the combination of ginger and lime! Thrilled to have you Lisa! We are big citrus fans, but don’t prefer the taste of ginger so much. I plan to try this with a reduced amount of ginger. Thanks for sharing the recipe! The ginger is ver subtle. I probably wouldn’t be able to pick it out if I didn’t know what it was. Let me know if you change it and how you like it! I’ve bookmarked this to make. Would make a good marinade for shrimp or pork, as well. Mmmm. Shrimp sounds good! Let me know if you try it. Great recipe for a marinade. I cannot wait to try it out. Lime and ginger perfect together. Oh my this is just what I want! I am so glad you linked up to “Made it on Monday”! This is a great Marinade, and just in time for grilling season. I will sure be trying this recipe soon. Thank you so much for sharing with Full Plate Thursday and hope to see you next week! Thanks Miz Helen! Let me know how you like it. Great idea to freeze chicken in the marinade. I’m going to have to remember that one. Love the sound of this recipe… really tempting. this looks yummy, very hearty meal! This marinated chicken looks delicious! Sounds like it would really be good with some pan-grilled or broiled chicken, too. Someone suggested shrimp. I think that would be great. What a great combination. I love ginger and lime. Thanks for linking up with Fat Camp Friday this week! See you next week! Certainly looks yummy! Thanks for sharing! Yum! I love those flavors! Thanks for sharing your marinade! Thanks for stopping by Darly! Sounds really good! I like the idea of freezing some too. This sounds like a really delicious marinade – I love the combination of lime and ginger. Great idea about making extra and marinading/freezing ahead of time too. There’s so many different ways to enjoy this recipe as well. Thank you for sharing it with the Hearth and Soul Blog Hop. Sounds really good and *fresh*. A good marinade can definitely make the meat! Thank you bringing this lovely recipe to Sugar Free Sundays! This looks yummy! I’m always looking for new ways to cook chicken.